Word and Deed: Internet: The Hardest Part of My Job? We've never explicitly blogged about the work that has gone into enabling us to blog from rural Burundi. Maintaining "reasonable" internet access has been quite a journey since 2013, and though we've made a lot of progress, I'm sure it will continue to be a big issue in years to come. Given the distance between us and many of the people that know and support us and our work, internet has been an essential tool. I'm only half joking when I refer to it as "the hardest part of my job". Comparing to some of the dramatic hospital experiences we have, it may not seem like much. However, I have felt so ill-prepared to try and handle this technical area that it has, at times, been a primary source of stress for me. My team has always been gracious towards my insufficiencies, but it has been an ongoing struggle for me not to feel their frustrations with our internet as personal failings. But enough about that. 2013: When we first arrived, we hoped to be able to use USB flash modems to connect to the internet via the mobile network. Everyone in the city thought this should be doable, and we talked to several people in the mobile world here to inquire about it. 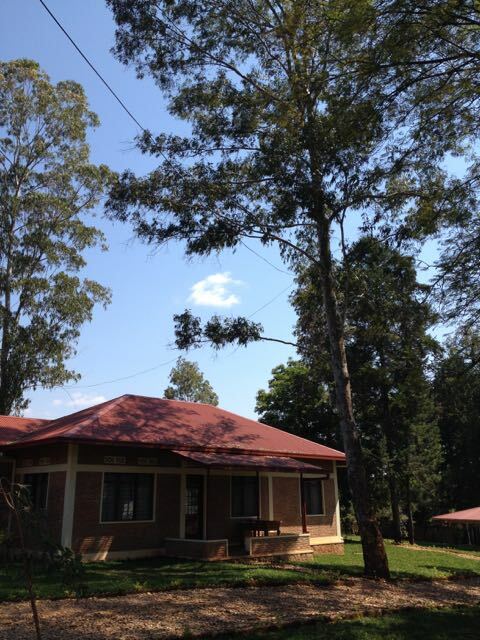 However, as it happened, Kibuye campus was uniquely located in the shadow of a hall that lay between it and the nearest mobile towers. Thus, the signal was limited, and no mobile company seemed to do anything about it. 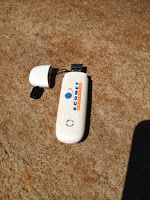 So, the first few months were characterized by long periods of waiting on this little modem to download emails. If you gave it about 15 minutes, it might have loaded a web page. But usually not. 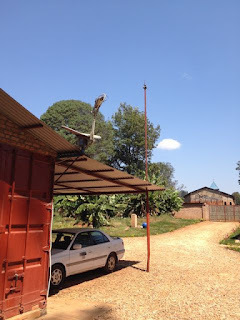 2014: After several months, we came to grips with the idea that the best option for us was a satellite modem (VSAT), which was reliable, but quite expensive for what you get. We were obviously bandwidth limited (mostly 512 kbps) and most of the next several years, we were also data limited (each family usually got about 3GB/month). I won't tell you how much we paid for it. =) It was an essential service, and usually worked pretty well when the power was on. However, it developed a bad habit of getting fried by lightning, and the modem had to be replaced several times. How does a signal get from this single point to the rest of the campus? That question has been a saga in and of itself, which many chapters and lots of help from many people. 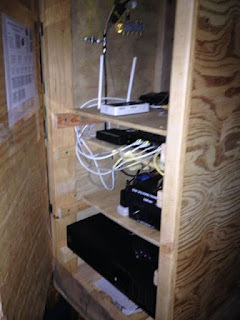 Suffice to say that the current set-up has some kind of connection in every home, though we have all spent many hours sitting outside the "internet cafe" at the container-plex (our central hub for internet) during various phases of these connections breaking down. Homes are connected via a combination of directional antennas, CAT-5 cable, coaxial cable, and a cool new unit from Ubiquiti called the AirMax Rocket. They all come together in one of our old container crates, that has been converted into our internet hub: a combination a wires, switches, and multiple layers of electrical protection. How does a doctor learn how to do all this stuff? He doesn't. I still feel like I don't have any idea what I'm doing oftentimes. However, we have been blessed with much great advice and help, most notably from Shawn Quinn and his friends at MoxieGroup. He has been out here twice, most recently brought his family. Thanks to all! And we are SOOO grateful for all the hard work you've done Eric!